Had you been born as late as the year 1900, even, you could have walked down the lane which runs between what is now the Larrence Parkin home and his cabinet shop in Woods Cross, Utah, to the top of a slight bluff and a little to your left would have been able to see what remained of the "dug-out" in which your grandfather, Joseph Moss, was born. 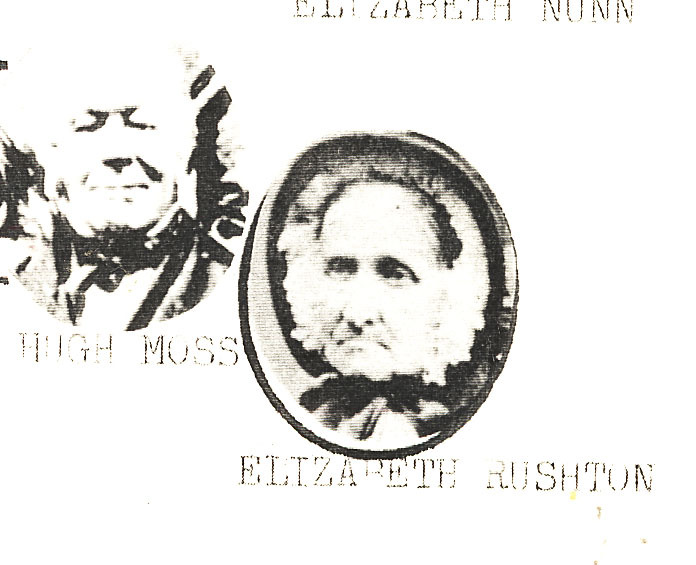 In the story of the life of great grandmother, Mary Elisabeth Snyder Wood, I have told you how the John Moss family came along to Utah with the Daniel Wood Fancily and that they remained in Salt Lake, City until after the death of their third child, Elizabeth, occurred on 19th of July 1849. As soon as John and Rebecca Moss decided to make their home in the North Canyon Ward, or Sessions Settlement, they squatted on a portion of land just south and a little to the west of Daniel Wood. Since it required time to get logs out of the canyon for a more permanent abode, and since John needed to plant what crops he could for food, he made a temporary shelter in the brow of the hill at the location previously described. John lined the dug-out with split rock. These rock were not laid in cement as we do now days, but held together fairly well witty a mud mortar. With the sides and back rocked up, poles could be laid across from wall to wall and then willows and branches covered over the poles. Earth was shoveled on top of the willows to a depth of about one foot or more. The floor remained treaded earth and a blanket or wagon cover served as a door. Joseph's mother, Rebecca, was happy to make her bed in this shelter. It was indeed better than the wagon box which had served as "home" for so long. John hurried to complete this shelter for Rebecca by the time son Joseph was born, l0 August 1850. He is said to be the second white child born in this locality. Joseph's father, John, had learned from his father-in-law, Daniel Wood, the value of fertile earth and so was happy with his homestead. 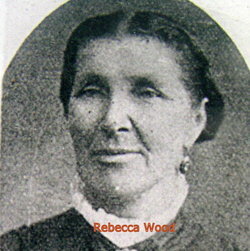 Rebecca made no complaint as to the facilities granted her; but assisted in every way to help establish a home. John got out the firewood and logs from the canyon as soon as possible and built a small log home on top of the rise in the ground. Many things happened in this little log cabin that would have been of interest to us; but other than the birth of other members of the family we haven't much of a record. The fireplace at one end served for warmth and cooking as well as light by night. Rebecca did not complain because the floor was of the good earth for quite a while before John hard time to lay a floor of split timber. At this time of the history of Utah, Indians traveled back and forth as they hunted and fished. They soon learned that they would be given food if they asked for, or sometimes demanded it. One day when John and Rebecca went into Salt Lake to take care of some business they left Joseph at home with his sister Mary. For reasons which we are unable to understand, Indians were very desirous of owning a white child. It didn't take the Indians who called at John Moss home that day„ long to realize that the children were at home alone. They asked for food and then decided they would the little Joseph. Away ran Mary to the neighbors to get some help. By the time the neighbors arrived the Indians were gone, leaving Joseph crying for his sister. We have been told that John Moss, brought livestock to Utah with him but there in no record of the exact number. However, we know that he appreciated their value and took care of their increase. As soon ate: Joseph and his brother Daniel here old enough to help with the care of the animals they were assigned this responsibility. Many of the neighbor had brought stock with them. also, and so the boys of the different families were given turns at the herding. In the spring they found forage on the hills south of the settlement but in the fall the cattle were taken to the Jordan River Bottom land. Joseph's scholastic training suffered because of these assignments. Sometimes he didn't, attend at all. Although he received but little school room training he became a good reader and could figure the answer to a problem in his head as fast as most could by writing it out. He always realized that this, part of his education was not on a par with others, so made no attempt to display what he did know. The family food and clothing depended mostly on products from the livestock and Joseph realized his responsibility in helping. The boys had fun at their herding. They found nestings of the birds, played games, learned to swim as well as to ride their ponies. There were seasons when the crops failed that they were hungry enough to dig roots and pick wild berries to satisfy their hunger. Food wasn't purchased at a corner grocery store in those days. At first grandfather John used these public domains for the forage of his stock. Joseph assisted in getting out the logs and poles with which they enclosed a space for corralling at time of branding and searing. A log house was built at this enclosure which was located on the property where the Orchard Ward Chaple, South Davis, Stake, now stands. After the shearing the wool was taken to Beck's Hot Springs where it was washed in the warm water. But the time cane later on when it became necessary to purchase this property, due to the increase in population in the vicinity. On Page 786 of Davis County Deeds you will find that on 24 January 1880 John Moss bought forty acres of land from the Union Pacific Railroad Company. The corral and house previously mentioned were located on this forty acres which had been granted to the Railroad Company as is customary in laying railroads. The Lord blessed the John Moss Family in more ways than one. By 1857 three more sons had been born, namely, John Hugh born in 1852, William born 1855 and Moroni born 1857. John knew that his family needed a lager home, so this time he built a two story brick edifice. Just what year he completed it we have no record, but feel quite certain that at least Rebecca Jane born 1860, Ellen born l862, and Nephi born 1863 must have first seen the light of day in this structure. John Moss continued to do his part for the upbuilding of the community. The first little combination school and church house used by the South District of the North Canyon Ward was used by his family on various occasions. He helped construct the second community hall and as his boys grew they learned to assist with community projects. They held membership in the North Canyon Ward but were given responsibilities in the South District. Grandfather John was set apart as Presiding Elder of the South District but we do not have the date of this ordination. There were at least three others who preceded him in this office. We are sure that Joseph witnessed the burial of several members of the North Canyon Ward in the little cemetery just across the street south of the present South Bountiful Chapel. It has been established as the second burial plot in the State of Utah. In it were laid to rest not only church members but members of parties traveling to the North West Territory. On 25 March John Moss took unto himself another wife. He and Rebecca had spent many hours making this decision; but, Rebecca gave her consent in order that John could be the recipient, of the blessing's promised those who entered this covenant, Emma Alexander, a lovely English convert, was the lady of his choice. Together, the two families lived in the read brick house in peace and harmony. On 26 November 1866 Rebecca gave birth to a daughter who they named Alice and on 8 January 1867 Emma was granted her first child, a son, who she named Davis. From time to time members of the various settlements were called on to send wagons and provisions to the Platte River to sustain and assist those who were poorly equipped for their westward journey to Utah. In the summer of 1867 a group of wagons were outfitted from the Sessions Settlement, or Bountiful as it is now called. Joseph went along with this group, driving the team of oxen which drew the wagon of supplies contributed by his father and some other of his, neighbors. Silver'Creek the families made butter and cheese to exchange for clothing or farm equipment as was needed by them so that the wives and daughters came in for their share of there, also. The road through Weber Canyon was in constant need of repair. Joseph was sometimes sent to help with his father's, assignment in its maintenance. When President Young learned that it Was up to him to build the branch railroad from Salt Lake to Ogden in 1869 he proceeded in his systematic way to have the survey made and the construction put under way. John Moss much concerned, as were other members of this; community, to learn that their farms would be included in the line of survey. At this time Joseph was about nineteen years old, and had had many experiences; but to witness the first train making its initial run from Ogden to Salt Lake as he stood in his own door yard was something new and interesting to him. In February 1871 Joseph's brother, Daniel, had married and was very happy in his own home. It wasn't long until Joseph decided that he, too, should take this step. Daniel and Melvina Rushton and Joseph and Sarah Phoebe Sessions were very closely associated and had much in common as young folk together. So it was decided that 18 December 1871 should be the wedding date. Joseph had been baptized 4 June 1859 and was faithful in his, Priesthood assignments from then on. He and Sarah were ready to receive their endowments and were married in the House of the Lord. Now, Joseph was quite proud of the lady of his choice. Her parents, David and Phoebe Foss Sessions were both well educated and were first settlers in the Bountiful settlement. Sarah's education had not been neglected since her mother was one of the first school teachers of Sessions Settlement. From her mother she had learned many home making skills and from her father, who had received a partial medical education before coming to Utah, she learned much that was useful in the care of her children. Joseph purchased a bit of ground, part of which was in the school section. It was located on the main Woods Cross road about a mile south of the South Bountiful Center. While he was erecting a sill adobe home on the property he and Sarah lived in, part of Daniel's home. The house was not completed when they moved into it. It was here that all of their family from Phoebe to Ellen were born. Of course, by the time the twins came, more rooms had been added. Joseph was very, busy fencing his land, digging a well, working at the brickyard for extra cash and helping with the Moss brothers live stock projects. At first he obtained firewood from the canyons but later he hauled coal from Coalville. It was a happy home although there were few luxuries. Joseph and Sarah were good managers and met their obligations as they came along. 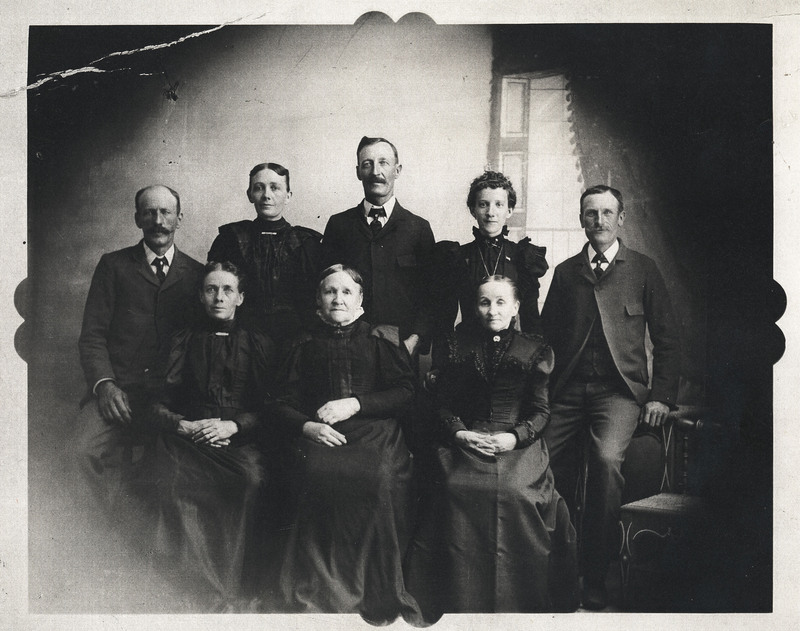 There was much to laugh at and sometimes things to cry about in this family which consisted of Sarah Phoebe, 28 March 1873; Mary Rebecca, 9 August 1875; Joseph William, 15 Dec. 1877; Olive Cerdenia, 25 Aug. 1881; Cora and Carrie, 8 Sept. 1884; Calvin W., 31 Dec. 1886; David Sessions, 4 May 1889; and Ellen, 11 Jan. 1892. At a special meeting held in the North Canyon Ward, Wednesday 20 June 1877 the Ward was divided into three separate Wards, namely ; East, West and South Bountiful. William Brown was sustained as Bishop of the South Bountiful Ward. The people of South District were happy, with this transaction. No longer would they need to walk or go. by team the long distance to their meetings in Bountiful. But it would also mean a greater number of responsibilities, and assignments for the members. In the early part of 1878 the First Presidency of the Church sent out a request to the Wards to send to them & representative woman who could comprehend the importance of the construction of the robes worn by the Priesthood in their Prayer Circle. Since Sarah had had much experience in helping her mother to make the burial clothing for the dead of the North Canyon Ward, it was she whom Bishop Brown chose for this calling. Now, son William was but a baby at this time but she responded to the calling and on the appointed day went to home of Precinda Kimball in Salt Lake where she saw and examined the original patterns which were designed by the Prophet Joseph Smith. After receiving instructions as to the purpose of the articles each representative was given a pattern cut from the original. Sarah cherished these patterns and in turn helped cut, construct and sew mostly by hand, the first twenty four suits used by the South Bountiful Melchizedek Priesthood in their prayer circle. Joseph assisted his wife by baby tending and furnishing the transportation to the several homes while the construction was going on. Since he was one of those chosen for this circle he left what he was doing each Thursday, to attend to the ecclesiastical duties of the time. It was at these meetings that problems of the community were discussed and divine guidance was sought in their solution. Joseph and Sarah were greatly concerned when the Diphtheria epidemic came in 1878 but fortunately their children survived. Sarah was called to assist in many homes not so fortunate, however. She helped prepare bodies for burial and made clothing for the occasion for several children. Joseph was pleased that his wife could be of assistance to others in time of need. Often he helped her with the making of home made remedies for the ailments of the family. He learned what herbs to bring in from the fields for her teas and poultices. You see, there just wasn't any drug store from which to purchase these things. On 25 July 1878 Sarah was chosen to act as Secretary for the first Retrenchment Association organized in the South Ward. This organization was the forerunner of the present Young Ladies Mutual Improvement Association. And Joseph was called to help with the Sunday School and the Young Men's Literary Association and his Priesthood assignments; so that each helped the other as the callings came. In March 1882 Joseph was saddened by the death of his mother and in August of 1884 his father passed away. At this time Joseph in his turn was given a blessing by his father as well as. his portion of the estate. The arrival of twin daughters at the home of Joseph and Sarah Moss created much comment in the community on 8 September 1884. They were christened Cora and Carrie. It become Phoebes responsibility to care for Carrie while Mary tended Cora. Many times Sarah took the twins with her as she visited her Relief Society district. She had no twin baby buggy, so her companion carried one child as Sarah carried the other. About, the time son David was born, 4 Mar 1889 the heads of several of the families in the community met to discuss the project of combining all of the community herds of livestock. It was not until 1891 that the necessary steps hand been taken to complete this organization which was registered as the Deseret Live Stock Company, with Joseph's brother John Hugh, as President. Joseph entered his, holdings into the company and thus became a Stockholder. For many years, he and his best friend, John E. Hatch, transferred supplied to the Skull Valley and Wasatch Ranges for the ranches established there. Once Grandmother Sarah described the lunch which Joseph and John carried in a strong sack and a tin pail. There was home made bread, cheese, and butter, dried fruit, wild berry jams, home cured meat and sometimes eggs. Sometimes the food froze solid on the way. Grandfather Joseph was considerate of his horses on these cold winter trips. He warmed the shoulder pads and bits before placing them on the horses. But now the time arrived for the breaking of the family. 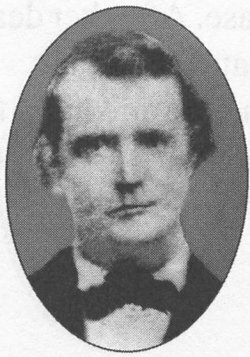 Just home from a mission was Jonathan H. Hale as he claimed Mary for his Wife, 28 April 1897. Two years later found Phoebe married to Edwin Porter 1 Feb. 1899. Although Olive was but seventeen when she married Ancel Clark Hatch, 13 Aug. 1899, she had much experience in the art of home making by her work at home. Shortly after Olive's marriage, Joseph's brother, William, purchased a farm in West Bountiful, built a large home and offered his residence in South Bountiful to Joseph. After due consideration Joseph and Sarah bought this property where stood a lovely two story home of seven rooms located just south and adjoining the present South Bountiful School house. Here the family enjoyed themselves with the extra living quarters as well as the addition of a culinary water system which Joseph and her brother David built. But the excitement and joy of the new home turned to anxiety when word was received that the oldest son and brother William, had met with an accident at the Robert Moss saw mill on Hillyard Flat (Wasatch). Joseph and Sarah were deeply concerned when it became necessary for the amputation of his foot. But William had lived a clean life and it soon mended so that on 13 Aug, 1902 he and his sweetheart, Lillian Aretta Porter were married. They made their home at Joseph's first residence. Then on 27 Mary 1908 Sylvanus Nelson claimed daughter Cora for his bride. After a short residence in Bountiful they left to make their home in Gunnison, Utah. But sorrow, came to them by the death of their two oldest daughters from Diptheria and due to crop failures they returned to South Bountiful to make a permanent home. About the time than Cora was married a call came for Calvin to act as a missionary. Joseph had not been privileged to go on a mission, so was happy to assist his son in this calling. Calvin was assigned to the Southern States, received his endowments 9 Oct . 1908, and departed shortly thereafter. Shortly after his return he married Olive Pearl Boulton, 9 Oct, 1912. Daughter Ellen had just finished her high school work in 1908, also, and was desirous of continuing her education. With the extra expense of Calvin's mission and Cora's wedding outfit, Joseph could not see his way to grant Ellen her wish at this time. The year 1908 seems to have been the one of the most changes in this. family since at this time daughter Carrie placed her application for training to become a nurse. During her training she was at home part of the time but the big house was taking on an air of desertion. No more the rooms rang with laugher as the children played together. No more were they bringing their playmates home or getting ready for parties:. Son David was employed by the Deseret Livestock Company, so was away from home most of the time. A quietness settled on the home which was not to the liking of Joseph and Sarah. chosen Nins Folsom of Salt Lake City to share his life with him. One week later daughter Ellen followed suit and was married 12 Nov. 1913 to Orin Theo Cook. At intervals Carrie was at home as she continued with her work as a nurse but Joseph was not a young man by now. He was nearing the three score and ten year mark. His health was waning and consequently son Calvin and his family came to care for the farm and made their home in the south portion of the big house. On 26 Feb. 1919 Carrie closed her nursing career as she married Ezra Thurgood and went to her future home in Syracuse, Utah. Much time was spent by Joseph and Sarah from now on in welcoming their grandchildren as they came to visit. They scolded one another and laughed at the proceeding. Joseph continued with his Church assignments. We can almost hear Grandmother asking him if he had a clean handkerchief as she tied his tie as he made ready for his visiting teaching work. He only asked for release from this responsibility after 55 years. of faithful service. Aside from his work in the Sunday School, M.I.A., and Ward Teaching Group, he also had given time to Home Mission and Elders Quorum responsibilities. He was a High Priest for many years before his death. The first death in the family came at the passing of daughter Olive, 13 Oct. 1922, but was met with faith and courage by Joseph and Sarah. Plans for celebrating the fiftieth anniversary of the marriage of this couple were disrupted by the serious illness of Joseph. He regained his health, however, and lived to witness the sixtieth anniversary of this date. It did not take place in the large home, however, since fire in July 1931 destroyed the home. A small house was erected of the remains of the former one. Joseph and Sarah never seemed content in this new home. It was strange to them. Then Sarah lay helpless in the old fashioned bed with its high head board. Joseph either sat by her side and held her hand or wandered aimlessly about the farm. She closed her eyes in sleep 4 Aug. 1933. How patiently Joseph waited for the day that he might join her. Daughter Phoebe came to care for him. To him 31 Dec. 1934 was a joyous day. Again he was with his sweetheart of many years. Side by side they rest in the Bountiful City Cemetery, And thus came to a close the useful life of one of God's chosen men. May his children and their posterity ever conduct themselves in a manner which will bring honor to the good which he made every effort to accomplish.